Neuroscience has reached an extraordinary inflection point. Knowledge gleaned from decades of fundamental research on the brain can now be leveraged to treat some of the most devastating neurologic and psychiatric conditions. Experts believe that sensory disorders–those affecting vision, hearing, smell, taste, touch and pain in tens of millions of people across the globe–will be at the forefront of this revolution, in part because the sense organs are more accessible and more easily studied than deeper parts of the brain. 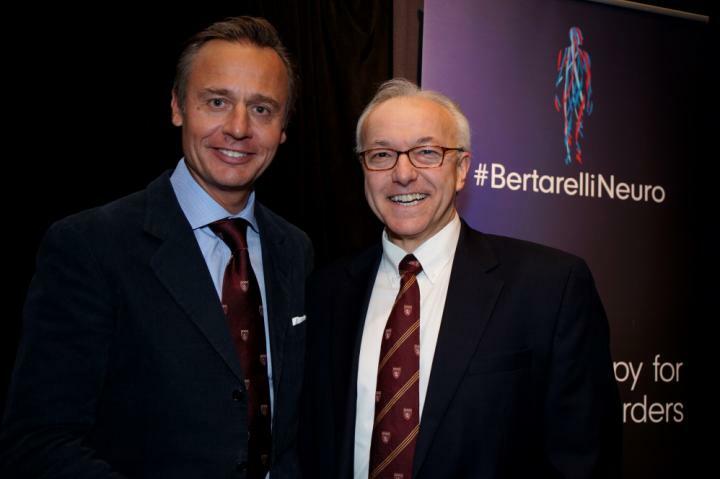 Now, the Bertarelli Foundation has announced that it is redoubling its investment in this area of research, with a gift of $6.35 million to Harvard Medical School (HMS) to build on the previous successes of the Bertarelli Program in Translational Neuroscience and Neuroengineering. Established in 2010, the program aims to help bridge the gap between basic and translational neuroscience and to help address important issues that, once solved, will have life-changing outcomes for patients. "In terms of scientific and medical research, Harvard Medical School remains at the pinnacle, and I am very pleased we are able to develop our partnership with this new program," says the Foundation's Ernesto Bertarelli, who is a member of the HMS Board of Fellows and a graduate of Harvard Business School. "The School's openness to exploring new ideas and collaborating with others for the benefit of patients is very important. This new gift aims to support fresh thinking and enable scientists to take forward new ideas, through effective partnership and innovation." Of this new gift, $5 million will support collaborative research projects focused on understanding and treating sensory disorders, as well as core facilities that will serve as technology incubators. These facilities will develop new instruments and methods that enable previously impossible investigations. "I am confident that the next five to 10 years will see many new treatments for deafness, blindness and pain, and I think the projects of the Bertarelli Program, which encourage cross-disciplinary solutions, will be among the most exciting and effective," says neurobiologist David Corey, the Bertarelli Professor of Translational Medical Science at HMS and the program's director. The remaining $1.35 million will support the continuation of an international fellows program, bringing five graduate students from École Polytechnique Fédérale de Lausanne (EPFL)–a research university in Switzerland that specializes in science and engineering–to Boston to complete year-long academic projects in labs at HMS and its affiliated hospitals. "The Bertarelli Program embodies our quest as physician-scientists to catalyze discovery from bench to bedside," says HMS Dean George Q. Daley. "The scientists funded over the past eight years have pinpointed some of the most fundamental aberrations at the root of sensory and neurologic disorders, and they are developing treatments that promise to transform the lives of countless patients, thanks to the foresight and generosity of Ernesto Bertarelli and the Bertarelli Foundation." At the heart of the Bertarelli Program are collaborative grants that bring together scientists, clinicians and medical specialists from diverse disciplines and institutions to push the boundaries of neuroscience and neuroengineering, creating what Ernesto Bertarelli has called "a melting pot of different talents, passions and visions united by a commitment to find groundbreaking ways to treat people and to make their lives better." Eleven grants have been awarded to date–six in 2011 and five in 2014–to researchers at Boston Children's Hospital, EPFL, HMS, Jules-Gonin Eye Hospital, Mass. Eye and Ear, Massachusetts General Hospital and Schepens Eye Research Institute of Mass. Eye and Ear. Four additional projects will be funded later this year thanks to renewed support from the Bertarelli Foundation. Each project will include a principal investigator at HMS and a collaborator from HMS, an HMS affiliate or another institution in the United States or elsewhere in the world. Among those awarded a collaborative grant is Tina Stankovic, the Sheldon and Dorothea Buckler Chair in Otolaryngology and chief of the Division of Otology and Neurotology at Massachusetts Eye and Ear, and an associate professor of otolaryngology at HMS. Working together with Demetri Psaltis at EPFL, her project focuses on developing new diagnostic methods for hearing loss. "This project is a great example of how investigators with markedly different skills and approaches have come together to solve an unmet need," says Corey. "Stankovic is a superb otologic surgeon, and Psaltis is a world?class optical engineer. Their work together over the past five years has shown great potential for transforming the way that otologists diagnose hearing loss." For Stankovic, Bertarelli Program funding has allowed her to focus on a vital clinical need: the inability of physicians to image a patient's inner-ear cells to establish precise diagnosis and guide therapy. She says that teaming up with Psaltis would not have happened without the program's funding. "Private philanthropy is critical in allowing us to tackle difficult, high-risk, high-reward projects. The Bertarelli Program has set a very high standard in this regard, and I'm delighted that it will continue to do so," says Stankovic. Another core component of the Bertarelli Program is its education initiative, which provides grants to EPFL graduate students who come to Boston to spend a year conducting their master's research in an HMS-affiliated laboratory. "These students are superbly trained in engineering and have strong quantitative and computational backgrounds," says Corey. "They bring these skills to more clinically oriented laboratories, greatly enriching the host laboratories while learning how to apply their knowledge and talents to important problems in medicine." Thirty-six Bertarelli Fellows have been supported to date, including Hugo Soulat. Under the faculty mentorship of Emery Brown in the Department of Anesthesia, Critical Care and Pain Medicine at Massachusetts General Hospital, Soulat is exploring real-time signal processing of the electroencephalogram to determine the depth of anesthesia during surgery. This will help guide the delivery of the precise amount of anesthesia. Soulat says Brown's experience as an anesthesiologist and statistician has been invaluable. "Communication between clinicians and scientists faces many hurdles, and therefore I consider myself privileged to work with someone proficient in both languages. As an engineer/mathematician, I am convinced this bridge is necessary for my current work and future career in translational neuroscience," says Soulat. Brown is grateful for the private fellowship funding provided by the Bertarelli Program because it provides key resources not available through other mechanisms. For example, because the students come to Harvard to do a one-year master's degree, the laboratory must define a concrete, tractable problem that can be solved in that time frame. "We have a number of those types of problems in the area of statistical analysis of neuroscience data," says Brown. "In general, finding funding and talented students for such projects is next to impossible. Now, not only are the students publishing their work, the successful completion of these projects allows us to write grants to obtain additional funding to support this research."